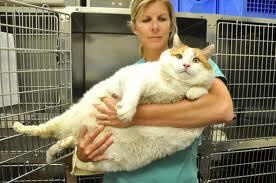 I had a friend who once had a rather fat kitty. He was like a walking ottoman (the cat, not the friend). He was a large square with a leg at each end. When he lay on his side, his feet didn’t touch. He was very sensitive about being laughed at, too. He lived to be thirteen, while poor Meow only lived to be two years old. Speaking of the Live-To-Eat vs. Eat-To-Live dichotomy. Have you seen this fascinating multi-part You Tube video Why Thin People Are Not Fat? It’s a documentary about an experiment to see how thin people are sometimes metabolically kinked to avoid fatness. As someone on the Live-To-Eat side of life, I found it intriguing stuff, for sure. This is one is for a book by Jaid Black. It’s of my favorite covers of all time.